RAJKOT: Tension gripped Mahuva town of Bhavnagar district after the Vishwa Hindu Parishad (VHP) president of Mahuva taluka was stabbed to death by members of the minority community late on Tuesday night. Police arrested three persons on Wednesday. 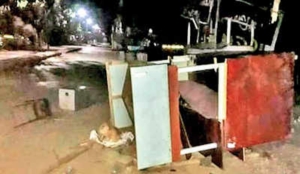 A State Reserve Police (SRP) company and additional police staff were deployed in Gandhi Chowk, Kuberbag and Meghdoot localities where mobs went on a rampage, vandalizing roadside eateries and shops. Police said the deceased Jayesh Gujaria (22) who was recently appointed as the president of Mahuva taluka VHP. He and his friend Mahesh Majithia (23), were attacked by the accused, identified as Bapudi, Aslam, Imran and their unidentified associate with knives and iron pipes. Police investigation has revealed that during the recently held Navratri festival, Gujaria and Bapudi had an altercation over the issue of putting up VHP hoardings. Both of them hurled abuses at each other and issued threats. Nursing a grudge against Gujaria, Bapudi and his aides attacked him. “The victims were sitting in Gandhi Chowk, when the accused arrived at the spot on two bikes. Straight away, they launched an attack, clubbing and stabbing Gujaria. When Majithia intervened, he too was attacked. Gujaria died in a private hospital in Bhavnagar,” said police….